A single Bridge is a terminal Silver. Like most of the terminal Silvers (Swindler, Woodcutter, Chancellor) it gives you a little plus: you could think of it as a Silver with +Buy that gives you $1 more per buy. So it’s a little more flexible than a Silver if you want to pick up cheap junk, but otherwise not all that interesting. The real power of Bridge, of course, is stacking them on top of each other. King’s Court and Throne Room are easy examples: KC – KC – Bridge – Bridge – Bridge is the original megaturn combo, which gives you -9 to all costs, $9, and 9 buys. It is guaranteed to be able to buy out 9 10 Provinces in a single turn (enough to empty the stack in 2p), and with a little help can even empty 9 10 Colonies. The key tipping point is when you have enough Bridges such that your target purchase costs $0: now your purchasing power is suddenly no longer limited by your money, but by your +Buy. In that sense Bridge is the archetypal “engine” card. If you’re playing mostly just money, then there is surely a superior terminal for your deck than Bridge. But with +Actions and +Cards, Bridge’s power accelerates with each Bridge added. Bridge shines with cards like Tactician, City, and Wharf: the typical mega-turn cards. In other words, Bridge is only worthwhile if you can play 2, 3, 4, etc. of them on a single turn, looking to empty all the piles at once. On boards where you have no real way of doing this, you may as well look elsewhere. It is technically possible to use Bridges to have some fun with Swindler, Upgrade, Saboteur, etc. In practice, this will not work. Don’t bother. Highway is the card with which to do that; if anything, you’re more likely to shoot yourself in the foot with Bridge and trash-for-benefit cards like Bishop (which suddenly gets a whole lot worse once you’ve played a lot of Bridges). You may as well just be playing an extra Bridge instead of going for these shenanigans. This entry was posted in Intrigue and tagged bridge. Bookmark the permalink. Good article. But I don’t understand why you quote Wharf… another terminal is often a bad addition to a bridge engine (except the goons). Laboratory, scrying pool or maybe stables are much better. Wharf is a pretty big component in a lot of engine decks because of how many cards it can draw. If you have an obscene amount of Actions then mixing Wharves into your Bridges means that you can end up playing more Bridges than you could with something like Laboratory. Wharf gives you a double-Lab next turn without needing to use up any more +Actions. This to me is really the key. If Wharf causes a terminal collision on turn 9, but then on turn 10 it draws you an extra Village/Bridge/whatever that hand can use, then it was probably worthwhile. One good hand beats two mediocre hands as always. Another excellent article by the man! theory might not be the best player in the world anymore, but he’s certainly the best teacher! Also in the ‘cute but will never actually work’ category: Workshop effects. I’d put them in the “cute, and sometimes works” catagory. They’re certainly nothing to turn down when they show up, if you have the actions to spare and there’s engine components that they can grab before the megaturns. +1. I have been on the receiving end of some clever Workshop use. It definitely does work as an engine accelerator in the right circumstances. Actually, thinking about it some more, Workshop effects can always pick up Bridges, and can normally pick up your villages as well, so they definitely help in the early stages of setting up your bridge engine, you just need to know when to switch from gaining effects to engine components, it’s probably sooner than you think, but it may be too slow to go for them at all. Another rare but effective move – if you have a strong bridge engine and Swindler, you can do amusing things like swindle a Gold into a Curse. Of course, at that point you can probably end the game anyway. A Horn of Plenty might be a bit easier to throw in. It’s like a +buy that doesn’t take an action. Bridge engines are even more obscene when you have Worker’s Village as your source of +actions and Wharf as your source of +cards … Not only do you get the rest of the provinces, but probably all of the duchies and many of the estates as well. I would like to add that one card that really shines with Bridge is Governor (assuming there is a +actions card available). +3 cards/+1 action is two labs, and you don’t care about giving your opponent a boatload of extra cards when you’re going to end the game with Bridges this turn. It’s especially good if there’s a nonterminal $2 card available, so you can even remodel away your coppers. Thanks again for another great article. I really enjoy these discussions of specific cards. I have appreciated its benefits with Throne Room and Kings Court for a while, but I hadn’t fully thought through its limitations with a straight money deck where it can’t be stacked. For those of us without the experience that so many others of you have, these articles give great insights that I have been able to use and to share with others we play with. I’m not sure if bridge really conflicts with trash for benefit cards, unlike highway which you’re required to play before using a terminal action. 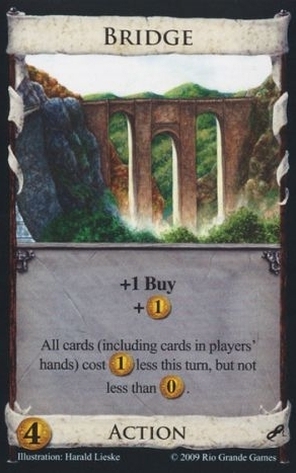 Outside of draw up to x cards such as library, or the odd case of shanty town, you’re never hurting your salvagers by holding onto bridges in hand. Bridge may be my favorite card in the game (other than maybe the TR/KC card repeaters). Because of the $0 floor, if you combine enough of them, you can greatly increase the power of cards like remodel, expand, and mine. Three bridges (and/or highways) allows you to mine a copper directly into a gold. Or you could remodel a curse into a $5 card. The only things it doesn’t help are those cards with exact value trashes, like remake. Of course, if you have bishops, you’re gonna want to play them before the bridges.